Abbo of Fleury also known as Abbon or Saint Abbo'. He was a monk, and then an abbot, in the Benedictine monastery of Fleury sur Loire near Orléans, in France.He was born near Orléans and was tought at Paris and Reims, he studied philosophy, mathematics, and astronomy. He lived in England for two years assisting Archbishop Oswald of York in restoring the monastic system. He was the director of the school of the newly founded monastery of Ramsey in the Huntingdon from 986 to 987. He learned of the martyrdom of Saint Edmund and wrote a passion in Latin on it. Abbo returned to Fleury in 988, where he was made abbot of Fleury. In (1004) he attempted to restore discipline in the monastery of La Reole, he transferring the monks of Fleury into that community. But the trouble got worst and fighting started between the two parties and when St. Abbo tried to separate them he was stabbed in the side by a lance. He covered the wound and made it to his cell, where he died in the arms of his faithful disciple Aimoin . His biography was written by Aimoin of Fleury. 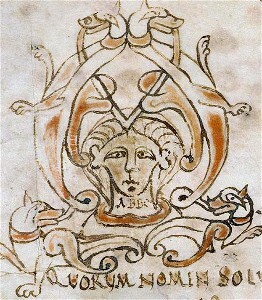 The picture aboveis Abbo of Fleury's tracts showing the word ABBO found in Saint-Benoît-sur-Loire abbey France. Finished reading about Saint Abbo, Bring me Back to Catholic Saints please.